If you’ve elevated your computer monitor by sitting it on a stack of printer paper, it might be time to invest in a more durable solution. 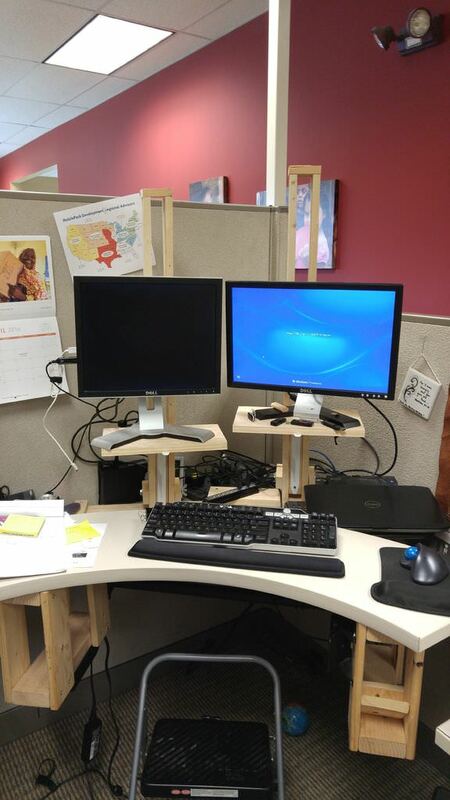 Sure, you can buy a computer monitor riser- but if you’ve got some basic carpentry skills you can build your own. 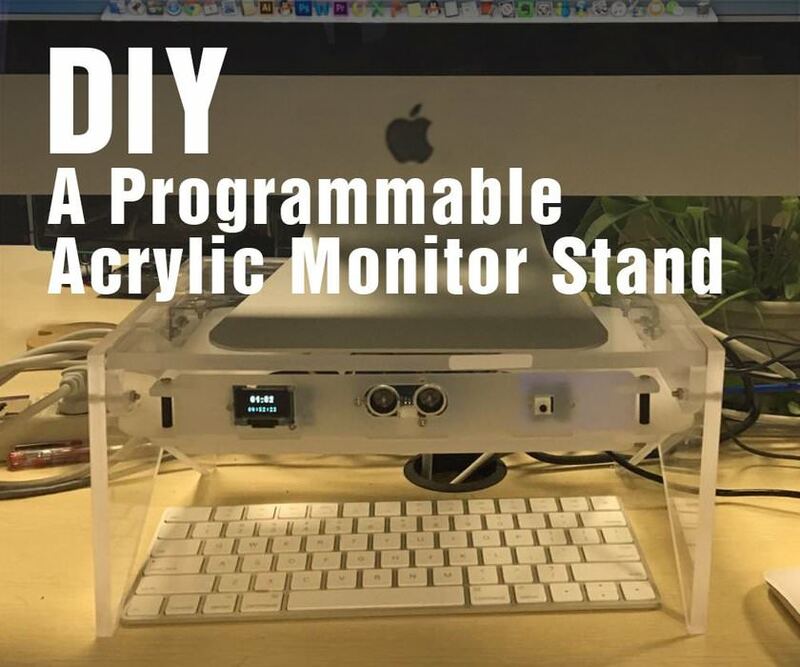 We’ve compiled a list of 14 DIY computer monitor stands below. There are a bunch of interesting options on this list that elevate your PC or Mac monitors while providing valuable storage space and an aesthetic enhancement. #13 is a rustic, walnut monitor stand complete with a turn-screw knob; #10 is an origami cardboard option; and #5 is a ‘hidden wire’ construction. This stand is perfect if you use your computer for a variety of functions — when working and typing, the screens can be tilted inward for a more focused view and when gaming or watching videos the screens can be tilted back for a relaxed and comfortable position. Using wood, coach bolts, wing nuts washers, and elastic straps, you can easily make this at home. If your monitors aren’t ready to be mounted, you’ll need to dismantle them from the stands. For a more finished look, you can stain or paint the wood to match your desk. This will also free up a lot of surface area on your table. If you don’t have an adjustable standing desk, you can easily replicate this by making these monitor stands that pivot up and down. By loosening a pair of wingnuts, you can increase or decrease the height of screen for sitting or standing. All you need are washers, screws, bolts, brackets, and your wood of choice. If you’re buying the wood from a home improvement store, they can also cut it to size for you. After the parts are ready, assemble the slider column, make the feet and the shelf, and you should have a working stand. 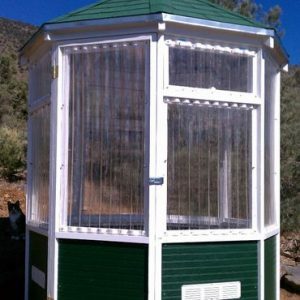 This DIY tutorial also features a time lapsed video of the builder constructing this. 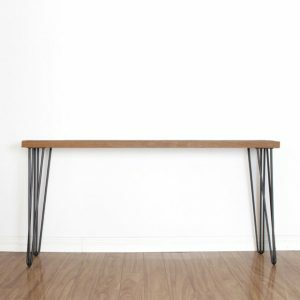 This stand is similar to a folding table and allows for two fixed height dimensions. 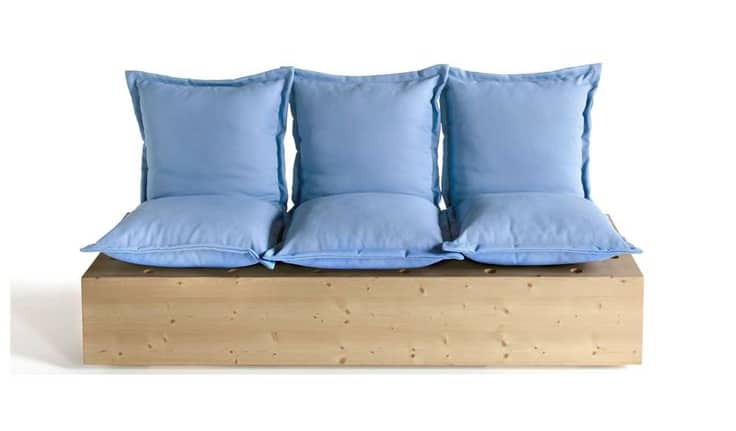 Made out of pine, this wood is relatively inexpensive and will wear very well. After cutting the wood, craft the base and platform for the monitor. To use this, simply extend the legs until they’re pulled taut. 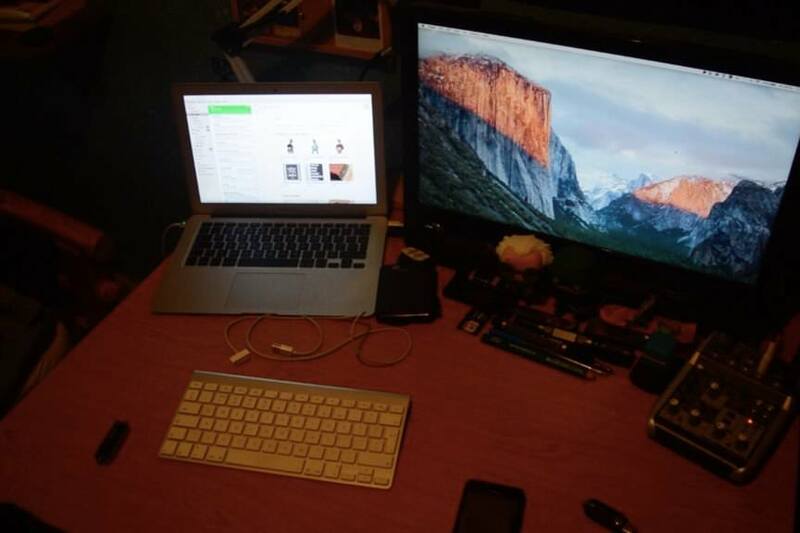 While this takes up the same amount of desk space as a regular monitor, when not in use it can easily be folded and stored away without taking up much space. For a more polished look, considering sanding this and painting it before assembly. 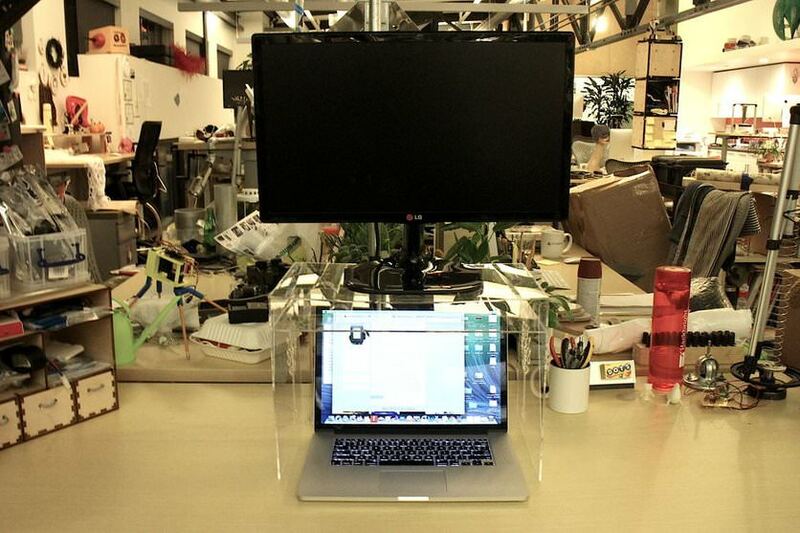 Most of us wish we had some extra desk space and this stand aims to solve that. 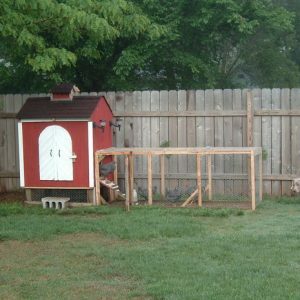 If you have some unused wood or pallets around the house, this will cost you virtually nothing to make. First, arrange the boards the way you want them, then glue and clamp them together. You’ll also need to sand this and make sure the ends are proper 90-degree angles using a jigsaw. 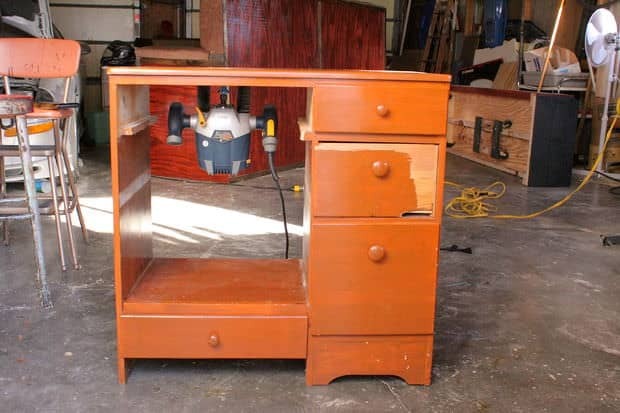 Now you need to figure out the desired height for this — when you have that, cut two blocks of wood at that length for the legs and nail them together. Staining and polishing the wood is an optional last step. Wires and cords can be unsightly and get in the way when you’re trying to work. This builder bought a pair of hollow floating shelves from Target and crafted a stand that encases all of the power cords and hard drives. Simply cut holes based on the size of the objects you’ll be putting through them and drill four pilot holes at the edges along the back of the shelf. Because this will be up against the wall, the builder didn’t bother to make clean cuts or finish the wood, though you can if you like. However, it is important to drill a good number of holes to let in air so the electronics don’t overheat. If you want something a little different to spice up your desk, this is a great DIY plan to follow. You’ll need jesmonite, a welder, angle iron, metal cutting saw, silicone mold, and flat bar stock. After making your design, you can use a 3D printer to bring it to life and simply print it out on paper and use that as a stencil to cut your wood. Once you have it, make a silicone mold, cast some panels, create the frame of the stand, epoxy the tiles together, and add finishing touches. If you have a wooden desk, you might to add some fabric pads to the corners so they don’t indent or scratch the lumber. This stand helps you get organized by providing a place for you to store your keyboard and use three USB ports. Easy to create, this DIY tutorial also has an accompanying video. 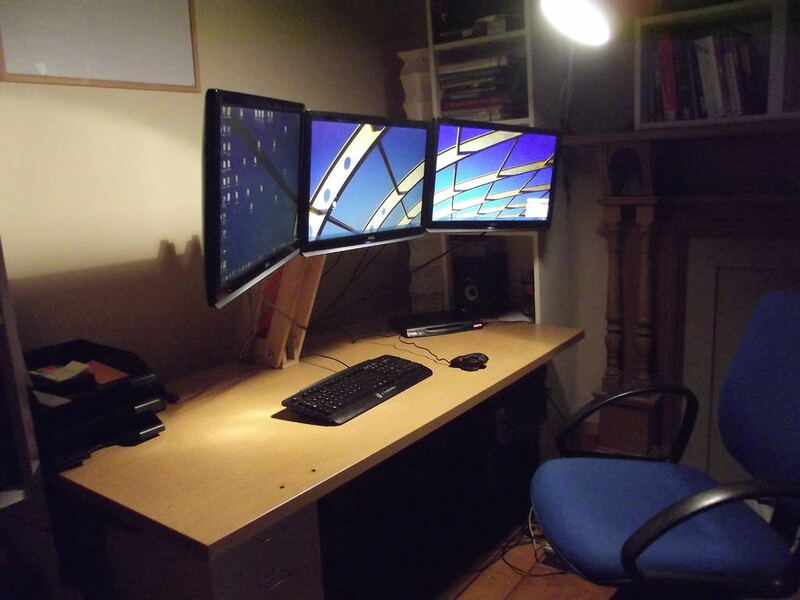 To make this, you’ll need an extension cable, wooden board, jigsaw, chisel, and USB hub. Using your keyboard and screen as a base, cut the wood to that size. Then, carve out space for the USB piece, making sure it fits snuggly but also is able to slide in and out if needed. After creating a wooden joint, sanding the wood, and polishing it, you’re ready to use this. This is a great inexpensive way to beautify your work area. 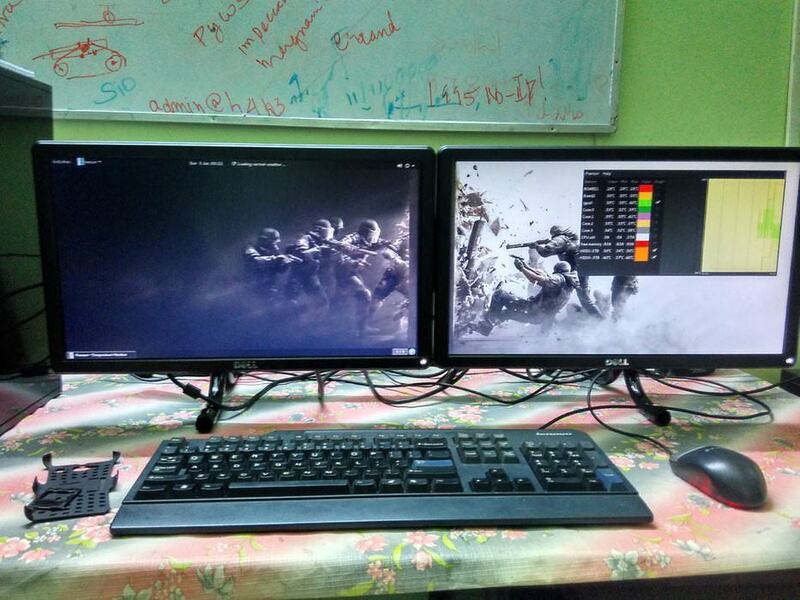 Buying dual monitor stands can be expensive, but following this DIY project will save you a good amount of money. 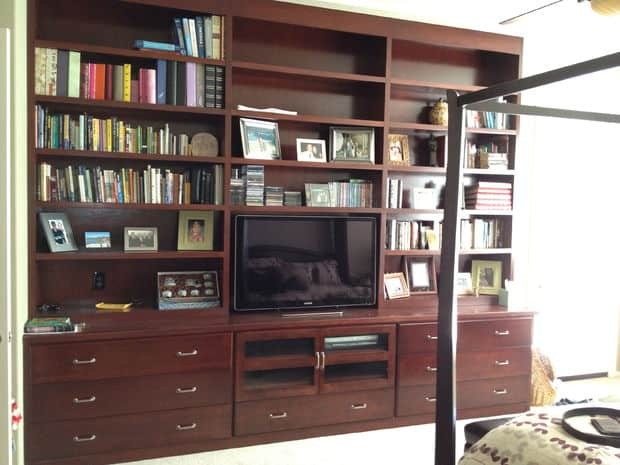 Materials required include end caps, screws, elbow joints, PVC pipes, micro screws, a wood batten, and metal clamps. After cutting the pipes to size, screw them into the base. Then, fix the back support on your screens, mount them, and then test to make sure they’re stable. All of these parts can be purchased from Amazon for around $15. Even better, this should take less than an hour to assemble. You can also paint or stain the wood feet, as this will be the only visible part of the stand. If you’re an avid hobbyist or into physical computing, it can be hard to organize your hardware, breadboards, wires, and computer screens. 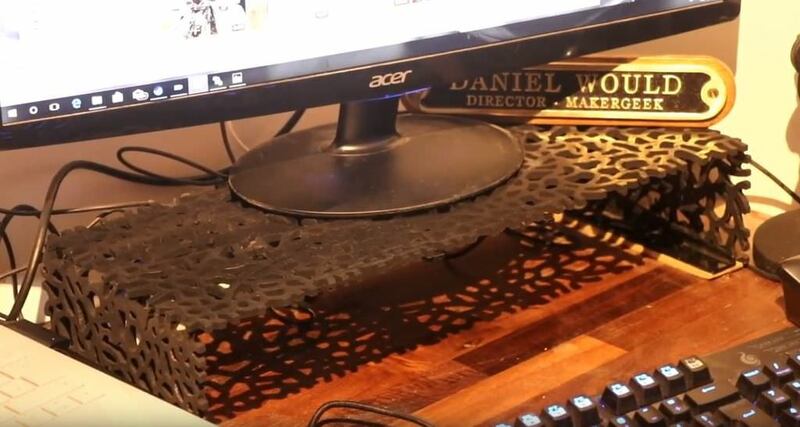 This creative DIY design allows you to elevate your desktop computer while providing space for a laptop and keyboard underneath. The only materials needed are table clamps, acrylic glue, a laser cutter, measuring tape, and command wire hooks. If you don’t have a laser cutter, you’ll have to pay for a service to make the cuts for you. You can also customize the dimensions to fit your exact computers. When the pieces are all ready, glue the legs to the shelf, glue supports and the hook platform, and add finishing touches. 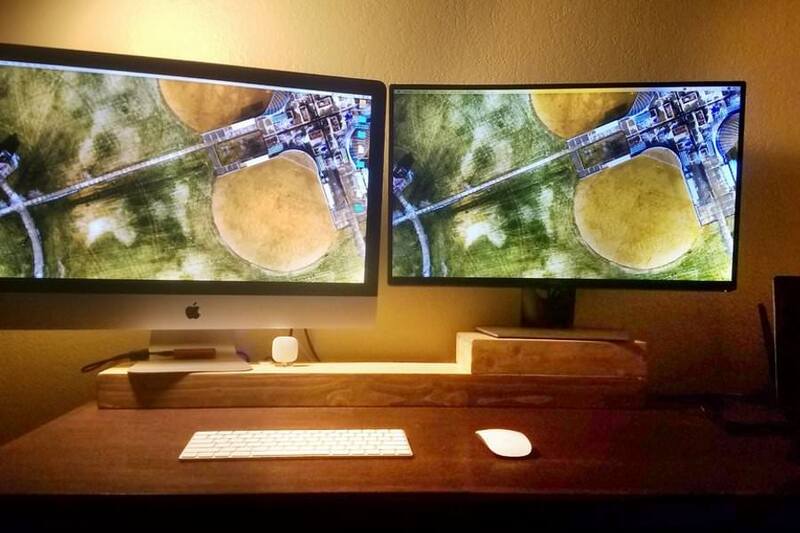 Believe it or not, you can make a stand for your computer out of an old box. All you need are a pair of scissors, pencil, ruler, and the lid of a thick box. You’ll need to cut short strips and then long strips, which will be constructed together to form an X. You can also add more cardboard along the sides for added support. Although not the most aesthetically pleasing, this is a great quick fix for an elevated screen. You can also paint this or glue strips of wallpaper over it to make it look more polished. 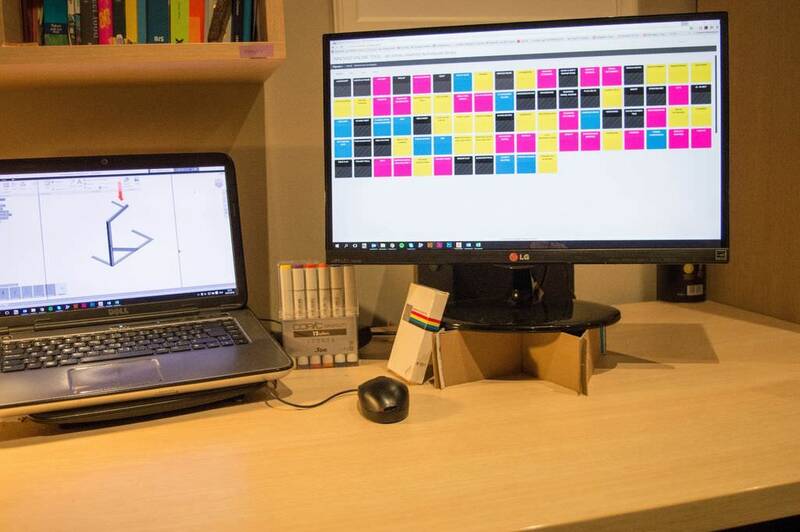 Built by a software engineer, this stand helps ease the strain on your neck, has a timer to track the hours you’re spending on the computer, and has an ultrasonic sensor to detect if someone is in front of your computer. You can make using an Arduino, copper cylinder, laser cutter, screws, acrylic, screwdriver, and some electronic modules. If you don’t have a laser cutter, you can make this out of wood or use a cutting service. When you have your supplies, begin assembly, make the hardware connections, program the software, and troubleshoot everything. Your keyboard can also fit underneath this. If you’re a writer who works with word processing and PDFs, it might be easier to mount your screen vertically. This base is made of plywood and the dimensions will depend on your exact monitor size. Once your wood is prepped, prepare your monitor, cut aluminum tubes, start assembling, and test it out to make sure all components are stable and secure. Orienting your screen to portrait mode will depend on your operating system and hardware brand, though it shouldn’t be too difficult. You can also sand and finish the wood before you put it all together. 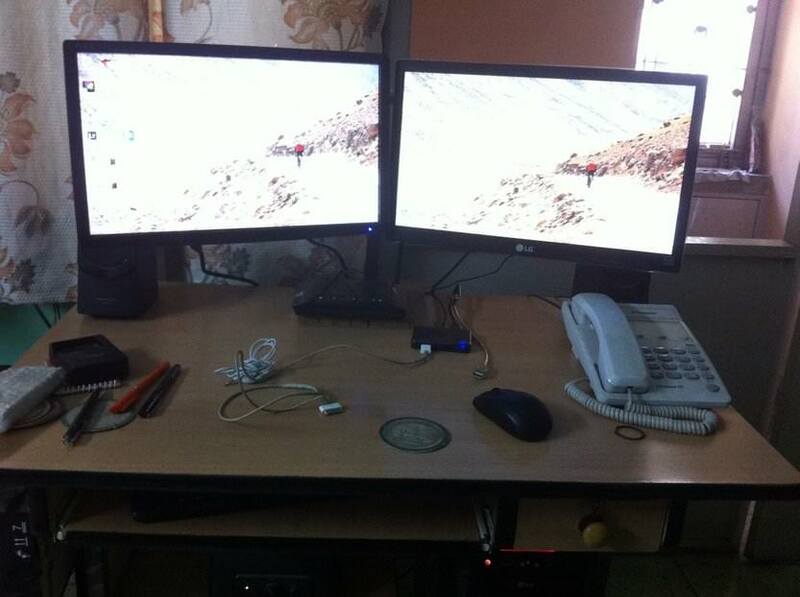 Today, new televisions can also easily be used as computer monitors. 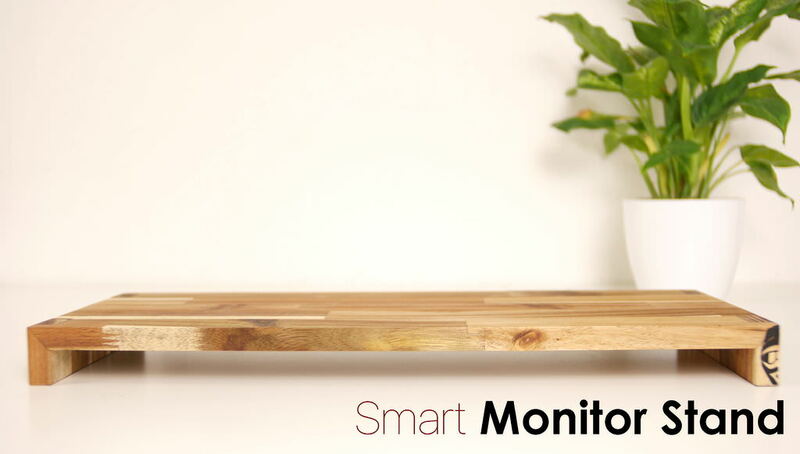 This DIY project offers a polished and rustic stand made out of walnut. Walnut is not a cheap wood, but you will only be using a small amount of it. If you’re new to woodworking, making a paper template will help you make the correct cuts. Cut your wood, predrill the holes, craft the base, connect the upright and base together, build the bracket and knob, then add final touches. It is very important to polish and treat this wood regularly. Once you’re positive everything is secure and the polish is dry, you can attach your monitor. 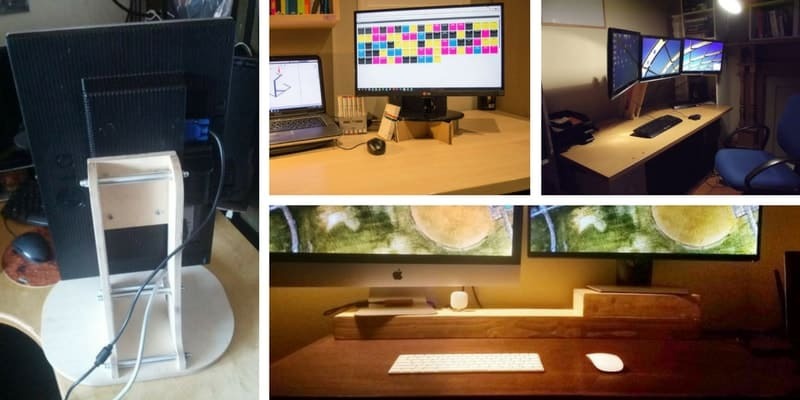 This solution to clear up space on your work area should cost you less than $10 to make. 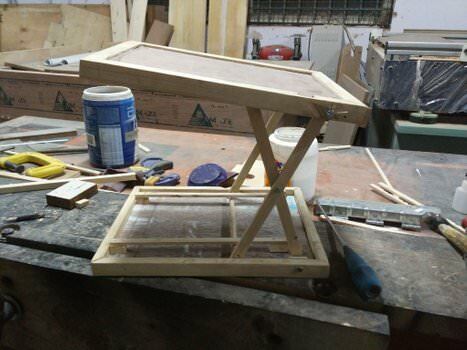 Required materials include a steel frame, paint, screws, clamps, and a mount if your screens don’t have one already. First, fix the wooden plank, prepare your monitors, paint the base whatever color you want, and assemble them together with screws. This is a simple and quick DIY plan that anyone can follow. If you want an elevated stand, you can use a taller steel frame and plank. It’s extremely important to make sure your monitors are screwed together properly — you don’t want them falling off! 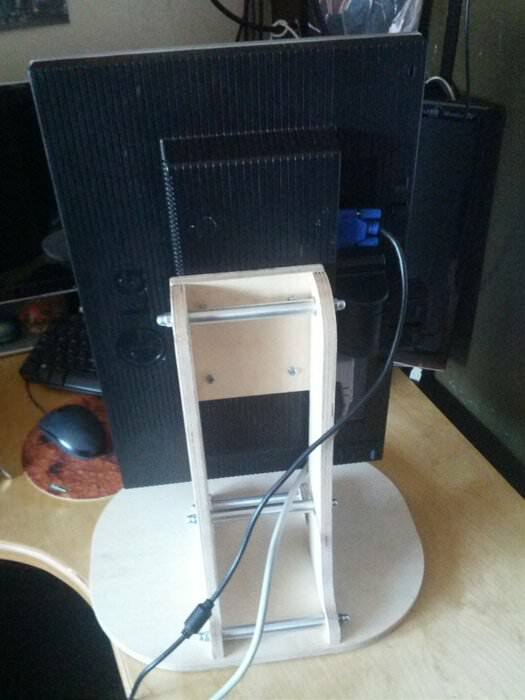 Over in Reddit, a user posted some images of his custom monitor riser build. 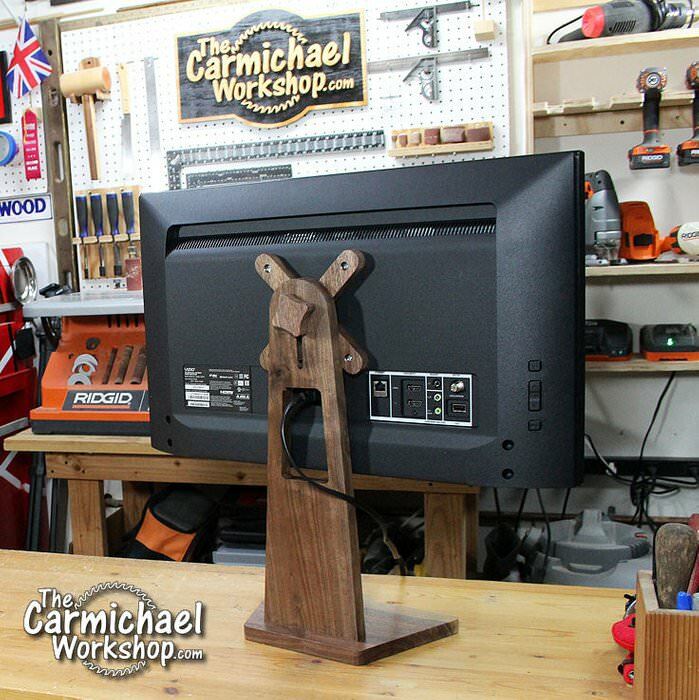 He used a wooden crate that he varnished and sanded down-and the finished product elevates his dual monitor display. He provided some storage space as well for video game controllers and wires to thread through below. Posters praised as an especially easy DIY option that was motivating and money-saving. He had been propping his computer monitor up on what looks like stacks of printer paper-but that was wobbly and unattractive. He was looking for a better solution that simultaneously provided some extra storage support. He painted some plywood black and created a riser with some cubby holes for an attractive DIY computer room solution. He explained that he used a handsaw with a clamp and didn’t have to sand to remove splinters. Another user said that if you want to build something but are lousy at construction you can head over to IKEA by a shelf with some legs and get the same results without having to hammer or saw anything yourself. Over in the PC Master Race subreddit, a user showcased his pipe monitor stand- his pictures show how he used duct tape where the waste pipes to create a pivoting monitor mount. A music engineer published his version-it’s a rack shelf stands to match the wood of his speakers-it also is custom measured to snugly fit some of his audio engineering hardware. There you have it- a bunch of inspiring monitor riser plans!